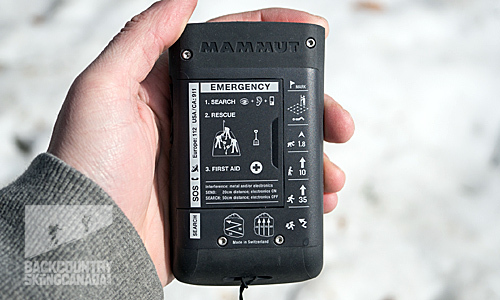 Because Avalanche Transceivers could one day save your life, you'll want a good one. We love the latest advanced/S model from Mammut because of its intuitive interface, big screen, long range and its appeal to pros and recreationalists alike. The Backcountry Skiing Canada Team. 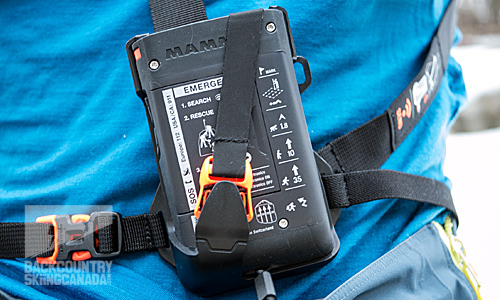 Mammut has introduced two new beacons to the market, the Barryvox and the Barryvox S. Coming off the back of their industry leading Pulse & Element beacons, Mammut has decided to keep to the formula of making both a “basic” and “advanced” device. In this review, we will concentrate on the Barryvox S, the model that has all the bells and whistles. N.B. 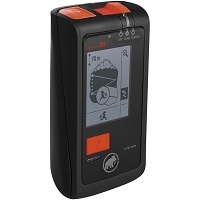 : If you pick up a Barryvox S this season, the firmware will be current. 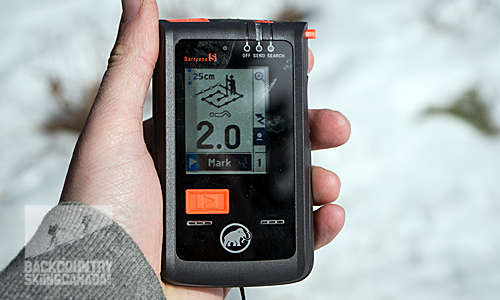 If this is your second season with it—as is our case—bring it to an authorized Barryvox dealer and get the 3.0 firmware update. Hit the arrow in the orange bar under the pic and see our full review. Field testing the Barryvox S in the burn. 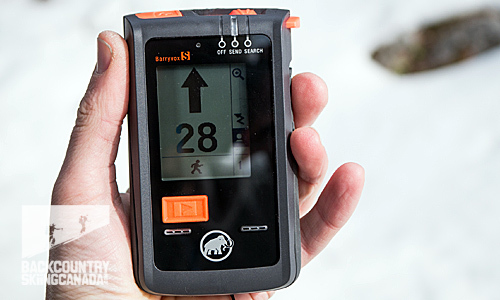 Here you can find our previous review on the Mammut Barryvox Element. It won our Gear of the year 2014 stamp of approval for its simple, intelligent and clean design that was both easy to use but at the same time very sophisticated and quick. The Element was released in conjunction with the Pulse model and they acted in the same way as the Barryvox and Barryvox S, with the Pulse having a more advanced feature-set. Mammut has used the information and experience gathered over these years and focused it on their new line up…. Let's get stuck in. The Barryvox S (the S stands for Smart) has a basic and Pro Search option. We will cover the beacon in basic mode initially and then go over the Pro Search features further down the page. 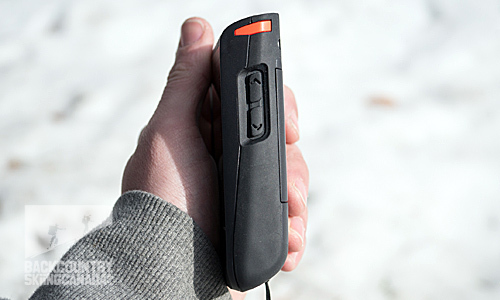 The Barryvox S fits comfortably in the palm of your hand—even with gloves. The single button on the front acts as a Mark button and “ENTER” for menu navigation. The On-Off switch works identically to the Element/Pulse models, with a lock that stops you from accidently changing the mode, though this is impossible when the beacon is its harness. This and all of the buttons on the beacon are easily operated with gloves on. Beacon is in SEND mode. Battery life indicated in the top left. When you switch your device into this mode a triple ascending BEEP will sound indicating that each individual signal pulse is working correctly. If the device gets a faulty reading from one of its pulse tests, a large alert is shown. Beacon now has found a signal and is showing direction, approx distance in metres, and arrows indicating the flux line transmission. Beacon is now in fine search, the mark button is now enabled, giving you the ability to flag a signal and move on to the next burial. Note the nifty, and clear iconography (ex. for probing). Two side buttons act as Up and Down buttons for menu navigation. Mammut has included very basic instructions on the rear of the beacon. This is also where you will find access to the battery compartment. One of the differences other than the cost between the Barryvox and the Barryvox S is Pro-Search. This setting opens up many advanced features and for a lot of users may be overkill. 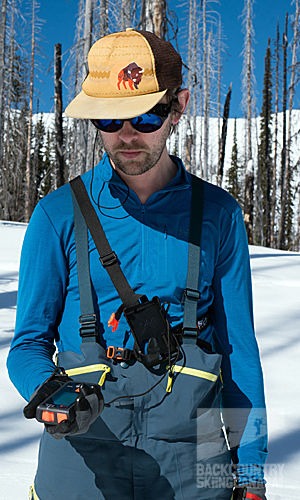 For experienced backcountry enthusiasts and professionals this mode offers many options and can be of help in a number of scenarios. To enable the Pro Search mode we need to use the advanced menu. This is done during the beacon's loading screen. Increase your signal search range from 70m to an impressive 100m, though the beacon will only operate with an Analog sound until the signal it is looking for is strong enough. This option is particularly useful for tree-well burials. 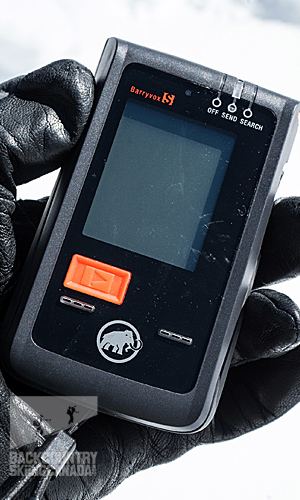 The option to turn on “Alternate search mode” for users who want to use different search methods often used in complex multiple burials. Aside from all these options, there are a handful more very important key features to mention! 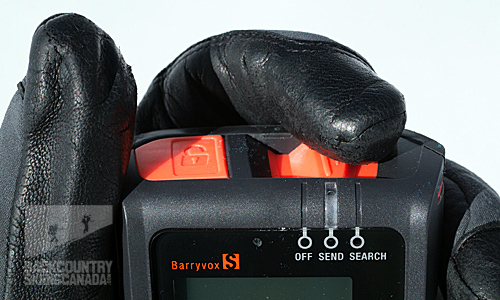 The Barryvox S has what's called “Auto-Guidance” which offers continued search guidance during signal overlap, something no other beacon can do. The beacon pre-maps the flux line and the motion sensor is able to tell where along that line the user is, so in the event of signal overlap (when two or more beacons signalling can create the illusion of only a single device) the beacon is able to continue the search un-interrupted. This background feature doesn't require the user to do anything and virtually eliminates the "stop stand still" screen prompt indicating signal overlap. “Smart Fine Search” allows for an improved fine grid-search and reduces it to a minimum. A user is able to follow the arrow in the wide search, right through the shortened fine search, directly to a "probe here" icon. Well.. That’s a lot of info. Because there are so many features and options, I didn't even get into stuff lie the "Group Check." Anyway...how is it? First off anyone who liked the Element or Pulse will find a natural transition to the Barryvox series. 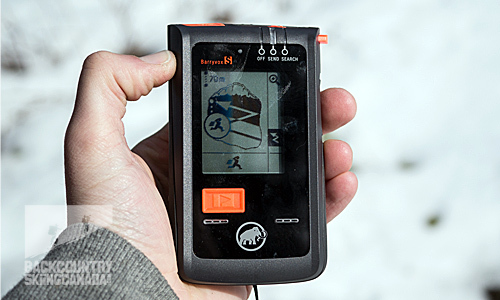 In this reviewer's opinion, the Barryvox S has a much easier menu to navigate than the Pulse and the improved advanced features are an obvious gain. As for the regular Joe, they might find that the basic Barryvox ticks enough boxes, especially with the lower price point ($425 CAD). The main difference between the two is that the “S” has Pro Search options, Auto Guidance and Smart Fine Search. There is a lot in there but not everybody needs it. 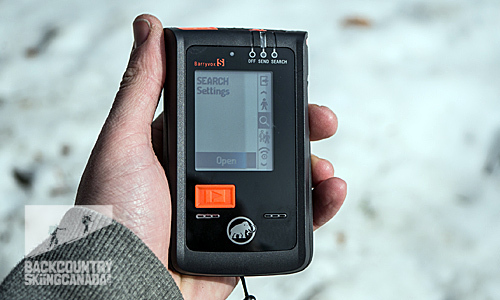 At the end of the day, a beacon has to be intuitive for a person to use it correctly, and while this often comes down to personal preference I think that Mammut has hit the nail on the head— it is not easy to create a device that is so laden with options yet still has simple functionality. Bravo! I like the display, it is very large at 2,2” and well back-lit for nighttime use yet also entirely visible in direct sunlight. The holster is comfortable, and like any good beacon you forget you’re even wearing it. It feels very well made and is clearly very durable in a tough casing. 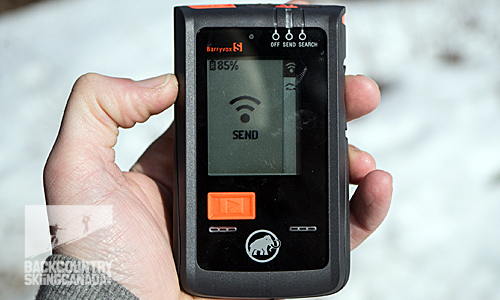 Mammut is dedicated to keeping their beacons current and the device is firmware updatable. I'll be entrusting this transceiver with my survival for many seasons to come.